If you happen to be eagerly awaiting the release of the Samsung GALAXY Note, then we have some exciting news for you. The manufacturer is expected to launch its smartphone-tablet hybrid a bit earlier than previously expected, namely as soon as this month. Germany, France, the UK, and other European countries are expected to get the Samsung GALAXY Note by the end of October, and the release of the device will be commemorated with big launch events. Its Korean debut, however, is scheduled for November, but the wait is going to be worth it as the device will be sold in its homeland with an LTE radio on board. 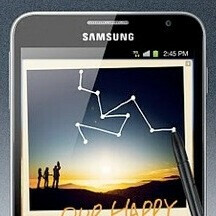 For those who need a refresher, the Samsung GALAXY Note aims to fill the gap between smartphones and tablets. It packs a 5.3-inch Super AMOLED display boasting the impressive resolution of 1280 by 800 pixels. A 1.4GHz dual-core chip provides the processing power, and Android 2.3 Gingerbread skinned with the TouchWiz user interface is what is in charge of the parade. Not to be forgotten are its 8-megapixel camera capable of shooting 1080p video and its 2-megapixel front one for video chats and self portraits. Unfortunately, we have no new information regarding the US launch of the GALAXY Note, meaning that we might not see it setting foot on American soil before Q1 of 2012. Still, the fact that the device has been already given the thumbs up by the FCC means that there is one less obstacle on its way to its stateside release. i would be tempted to get this if it came stateside. the close announcement of the note, gs2 and now the nexus makes it difficult to make the right choice. :) thanks samsung for the many options. It is a tough call, i've been waiting for months now for Nexus, but now that the note is going to come to us on att, i might wait a bit longer. Either way which ever phone i choose looks like it will be a great phone! There isnt a phone out there i want right now besides a samsung phone. I'm waiting on the Samsung note ..
Samsung is delivering the goods on all fronts I just got the epic touch 2 weeks ago and its the best smartphone out and with the note and prime dropping im already thinking of my next phone! So how can it be that Samsung announce that it will be released by the end of october and then.... Samsung announce it to be released in UK on the 17th of november?